"After learning that his brothers have been cured of their vertigo by finding true love and getting married, Brent becomes obsessed with finding the woman of his dreams. 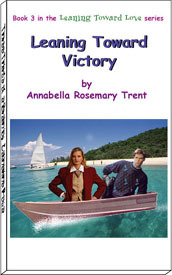 Through a series of comic misunderstandings he accidentally kidnaps lawyer Candace and enlists her help in fulfilling his dream of entering the America's Cup boat race with his trusty rowboat. When the race committee laughs at him and tells him his idea is ridiculous, Candace uses her legal training to find a loophole in the rules that allows dashing Brent to enter the competition. "Brent claims he knows of a 'shortcut' that could win them the race, but when they take it, a navigational error lands them 3,000 miles off course, giving Candace plenty of time to fall in love with him. But Brent won't even consider her romantically because she doesn't have a cute name that ends in an 'i'. Will Brent realize that he's got his map turned upside down? Will he think to remove the inspirational refrigerator magnet he's been using to decorate his compass? Most importantly, will Candace realize that her name can be shortened to 'Candi', the 'i' conveniently dotted with a heart?"